On Beach 96th Street in the Rockaways, right by the ocean, the local health clinic was a needed lifeline. Since Hurricane Sandy however, the clinic has been shuttered, the water made it up to the second floor and everything inside was destroyed. The mold is visible on the walls, the carpets ruined and destroyed. The clinic is in sad disrepair. Until Saturday when a hardy bunch of Irish volunteers arrived for the Day of Action. As team leader Dubliner Eric Moore recounted it was like another hurricane had hit the place, but this time a benign one, driven by the good intentions of an Irish community which showed up in force to help the stricken Rockaways. By the time I got there neighbors were poking their heads out the window or walking across the street to thank the Irish volunteers. Just a block from the beach many of their houses had been destroyed when Sandy hit but the arrival of the Irish gave them hope that things were actually going to get better. The 96th Street location was just one of five in the Rockaways peninsula that the 1,000 Irish who descended went to work on. 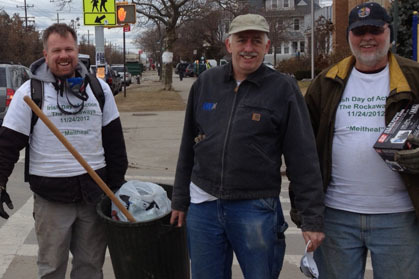 In Breezy Point, an AOH division cleaned out a Protestant church, perhaps the first time that has happened in history. The grateful pastor gave his blessings to the mainly Rockland Irish crew who worked all day. At St. Francis De Salles church the monsignor finally had his basement cleaned out and the sand removed. His church has been the center of much of the activity but he has had not time to clean up his own house – until the Irish arrived. One of my lasting memories from this day will be a crowd of Irish volunteers outside the parish residence as evening fell, sweeping, brushing, collecting, and clearly happy as they worked. The day had started in the pre-dawn for most of the Irish. From early morning 12 buses rolled from The Bronx, Yonkers, Queens, Manhattan and upstate Rockland. Hundreds of others drove by cars and trucks. Important logistical equipment was conveyed by Liffey Van Lines. When the volunteers arrived they fanned out to the pre-scouted locations. While there was some confusion at the beginning at some of the sites, soon work details were available for all. Right after the green on white Irish Day of Action T shirts (sponsored by Aer Lingus) were seen everywhere as the Irish got to work. “We knew we needed a response to the events in the Rockaways, we knew from the community that there was a pent up demand to do something,” said Irish consul General Noel Kilkenny. The different Irish Centers run by Siobhan Dennehy, Orla Kelleher and Paul Finnegan got behind the idea 100 per cent. Deputy Consul General Peter Ryan convened almost daily meetings, even over Thanksgiving and worked with Speaker Christine Quinn on transportation and issues on the ground in Rockaway. Turlough McConnell handled communications with the community. Location scouts such as Brian McCabe, Owen Rogers and Dan Dennehy went down to Rockaway to find the places of greatest need. I am happy to say I was one of those original members who sat with Kilkenny and Ryan and decided on the Day of Action. It was no sure success. It was set for the Saturday after Thanksgiving when many were away. It meant a very early start for the bus in the pre-dawn hour, it meant a lengthy day trip to the Rockaways and was very much dependent on weather. We should not have worried, Soon the rampant goodwill among the community for those injured and damaged by Sandy turned into a powerful force. We met so many exceptional people in the Rockaways. At Beach 38th street in St, Gertrude’s church, Reggie Warren and his staff operating in one of the hardest hit African Americans neighborhoods were running a clockwork organization with wall charts showing houses that needed to be cleared and people in need. In Hamilton Beach, perhaps the hardest hit area after Breezy Point, our volunteers were immediately swept up by the professional crews gathered there and sent to work. Likewise in Breezy Point the Habitat for Humanity folks had all their ducks in a row and our volunteers shovel ready for work assignments. Of all the places damaged Breezy Point shocks the most. The area where the 111 houses burned to the ground resembles an atom bomb crater with twisted metal, trees and buildings in every direction. Breezy is the most Irish town in America according to the U.S Census and it was great to see Old Glory and the Tricolor still flying high despite the massive setbacks. By day’s end the Irish community had contributed a massive 7,000 man-hours to helping the Rockaways in their huge recovery project. Many sat in the heated tent opposite St Frances De Salles church, donated by Irish firm Navillus tired but content and telling the stories of their day and the incredible gratitude shown them by locals. There were so many warm moments for them, and I know from conversations that many will be making their way down there in the weeks and months ahead. The Irish community has shown the way on the Rockaways and hopefully many other groups will follow. It was a day for Irish pride no question about it.